Are you looking for the best responsive free WordPress blog themes? 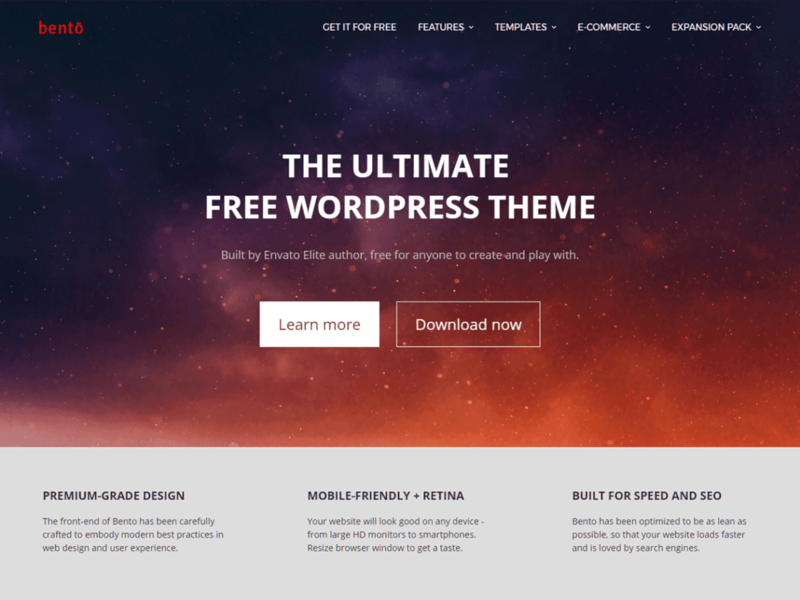 Then look no further than our expert selection of these free WordPress themes from WordPress.org repository. All of these WordPress themes have built with general features like custom backgrounds, custom colors, custom headers changing options, custom logo, menu, featured image header, pre-built page templates, and control panel to customize the appearance of themes and layouts. This theme is very simple yet powerful multipurpose responsive free WordPress blog themes from Code Themes developer club. 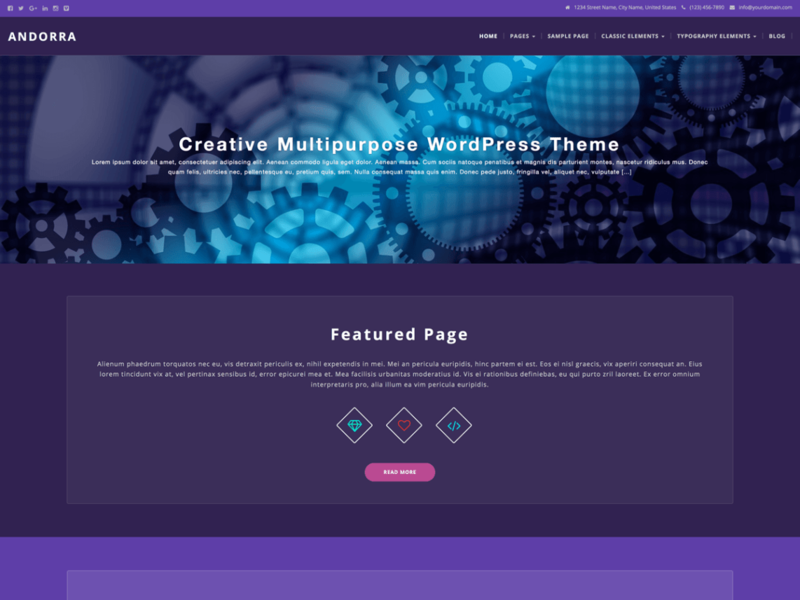 Purplous Lite WordPress Theme is free to download and use it for your projects. It comes with plenty of amazing features and customizable options to create a unique web design for your clients/customers. Moreover, The Purplous Lite theme is coming with Customizer API tool and live WordPress customizer. Generally, it can use for regular bloggers, photo bloggers, personal blogging, travelers, journalist, news bloggers, writers and anyone who’d like to showcase their personal details and contents. Andorra is another free WordPress blog theme from VM Themes developer club. This theme has designed for all kind of blogging related websites. But it designed to use for multipurpose creative services based websites as well. Andorra WordPress Theme is also supporting you to create an online e-commerce website with the help of WooCommerce plugin. Andorra theme is coming with a very powerful theme customization and live customizer option! 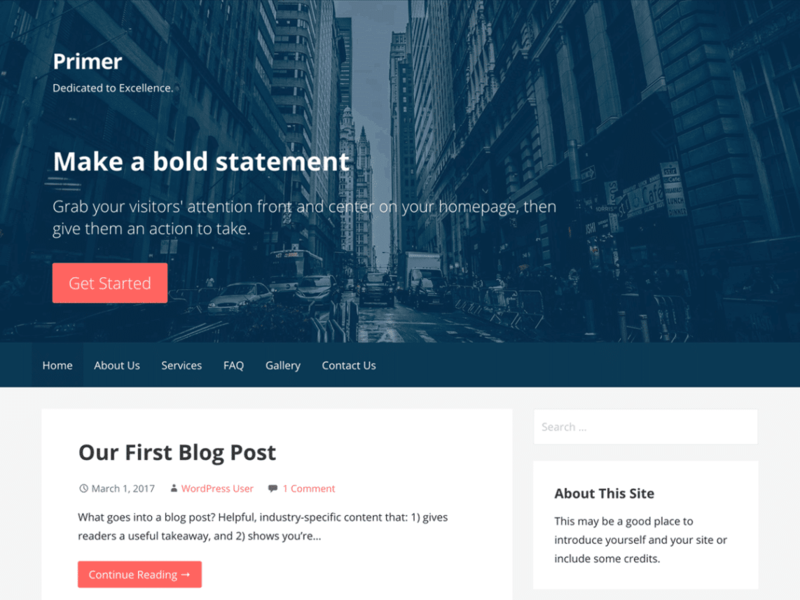 Primer is another great responsive free WordPress blog themes from Go Daddy developers. This theme is very simple and powerful fresh design to use for all in one blogging websites. Primer WordPress Theme can be used for lightweight blogging websites to showcase the bold contents and media files. You will have all great features to display the portfolios, contents, news and media files. Bento is a free responsive WordPress blog theme to create unlimited possibilities blogger websites. The design will boost your website to premium grade approach for visitors. Bento WordPress Theme is coming with WP Customizer, SEO best practice coding, 500+ high-quality vector icons, WooCommerce plugin support, advanced typography based Google web fonts and awesome UX design. 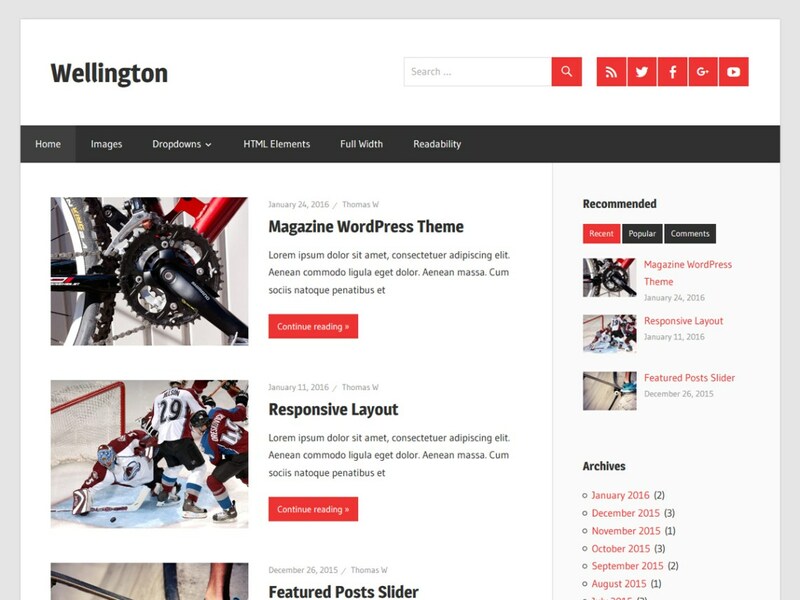 Wellington WordPress Theme is a simple and awesome responsive free blog theme from Theme Zee club. This theme can use for blogging websites, online magazine, travelers, news updates and blog related websites. It comes with 2 different post layouts and featured post slider. A perfectly designed lightweight blogging WordPress theme for bloggers! This theme is clean and elegantly designed responsive free WordPress blog themes from Vol Themes club. Marlin Lite WordPress Theme has built with the Bootstrap framework and responsive web design support for all smartphones and computer devices. 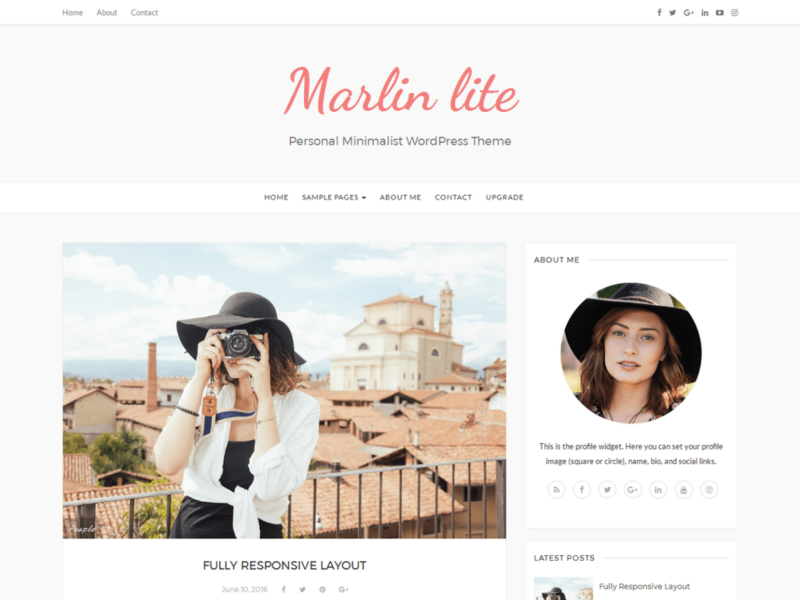 Marlin Lite theme can be used for creative bloggers, feminine bloggers, personal photography blogs, business blogs and professional blogging websites. It didn’t use many graphics and well coded by WordPress professionals. Marlin Lite is optimized for search engines and user-friendly web design. 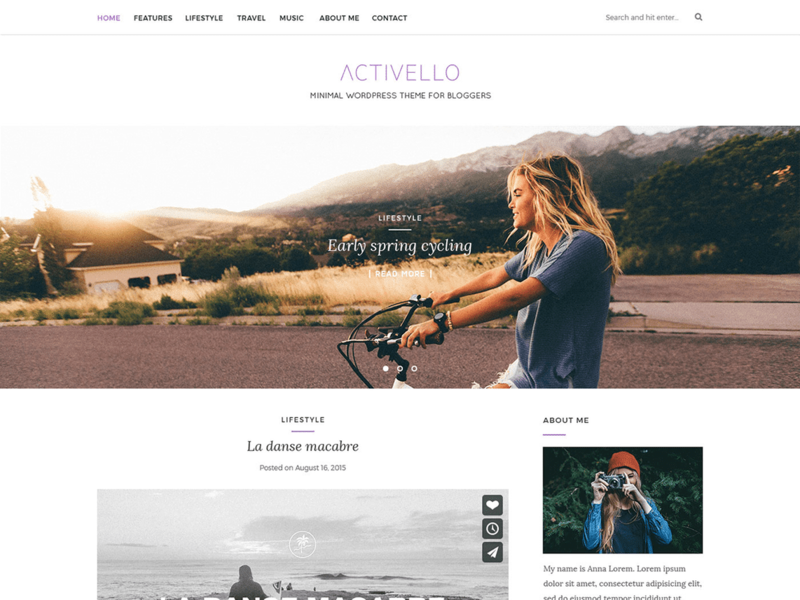 Activello is a minimal responsive free WordPress blog theme from Color Lib! This theme has designed to use for general blogging websites like food blogs, fashion blogs, travel blog, lifestyle blog, sports blog and any other blogging related websites. Activello WordPress Theme is also supporting for WooCommerce plugin and allow you to setup a fully functioning online e-commerce website to sell/buy goods on desired products. Activello supports SEO friendly design and live WP customizer options. 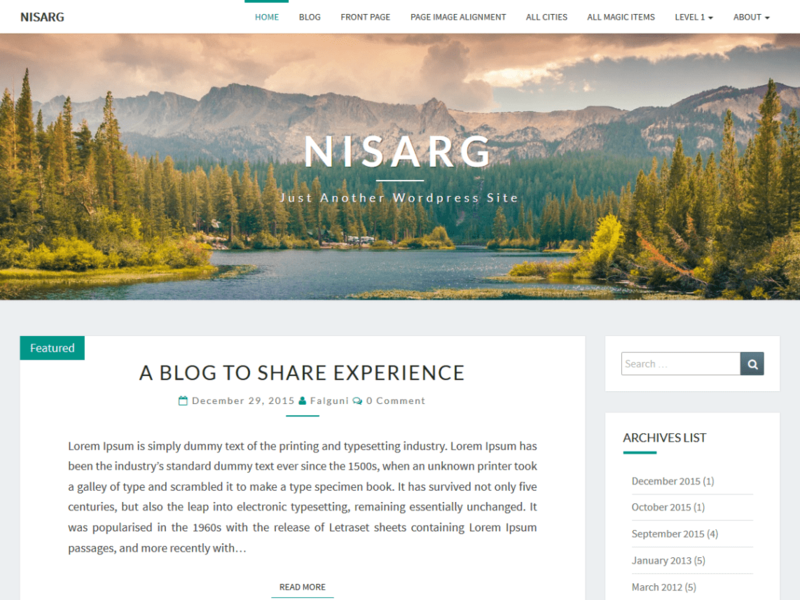 Nisarg WordPress Theme is a responsive free WordPress blog theme that allows you to create stunning blogs and websites. This theme can use for regular blogging sites, pro bloggers, travel lovers, photography blogs and all kind of blogging websites. Nisarg theme has built with Bootstrap 3 framework and live WordPress Customizer options. It comes with 8 pre-built page layout templates for Video, Image, Aside, Status, Audio, Quote, Link and Gallery. It is a free responsive WordPress blogging theme for blogs, magazine, news and business blogging websites. Hueman WordPress Theme has built with modern blog design and responsive web design. It has designed with lots of features and customization options. 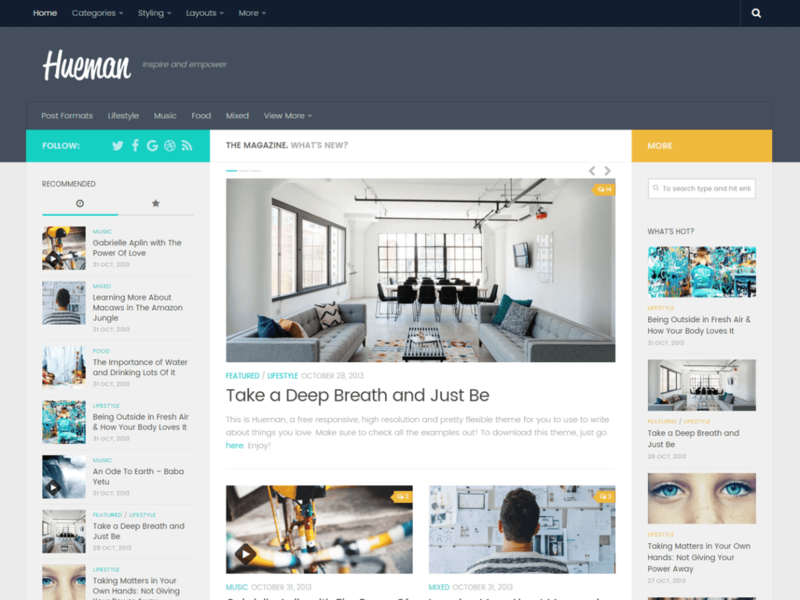 Overall, you will have a premium blog theme appearance in the free version. Some of the highlighted features are 8 post formats, sticky posts, 2, 3 columns and much more. 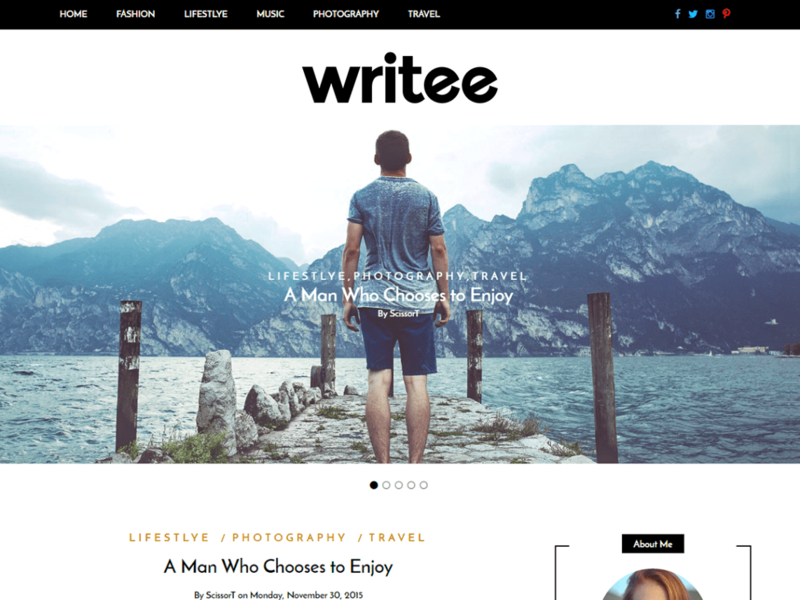 Writee is a simple and clean responsive free WordPress blog themes for blogging websites. It has designed to use for all kind of general blogging website. The design is very bold and visually stunning appearance to showcase your contents and media files. There are plenty of features available with Writee WordPress Theme, such as customizer options, full width/boxed width, custom widgets and content with styling options. Sparkling is a minimal design and free responsive WordPress blogging theme. It is well suited for travel blogs, health blogs, and finance blogging, portfolio, design, and art, photography, personal and e-commerce blogging websites. Sparkling WordPress Theme has built with Bootstrap 3 and SEO friendly web design. It is also coming with the latest technology and trends like HTML5, CSS3 and W3C valid codes. Since it is compatible with WPML plugin, you can do translation and support multilingual ready. 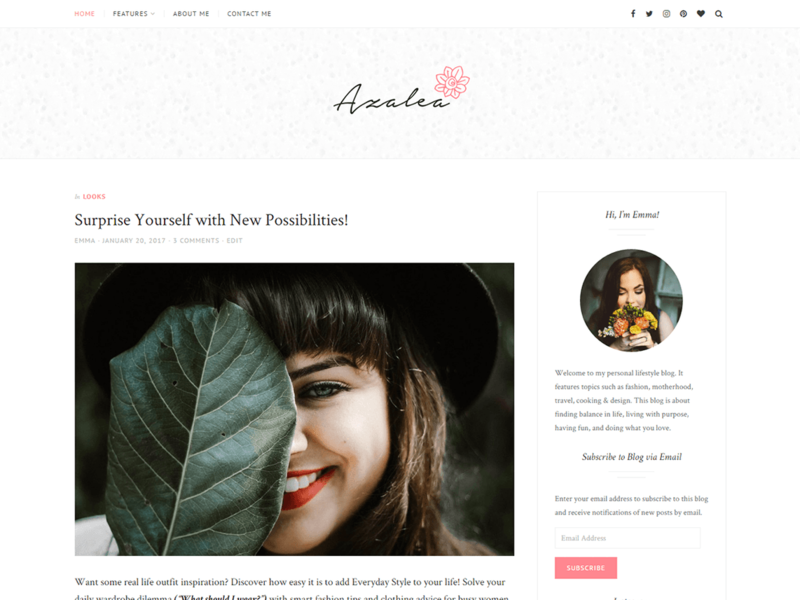 Azalea is a simple and clean responsive free WordPress personal blog theme. Generally, it can use for lifestyle, cooking, food blogs, fashion blogs and women related blogging websites. Azalea WordPress theme has built with lightweight graphic and well organized, SEO optimized coding by professionals. It has all necessary features to showcase your blogging contents and media files. 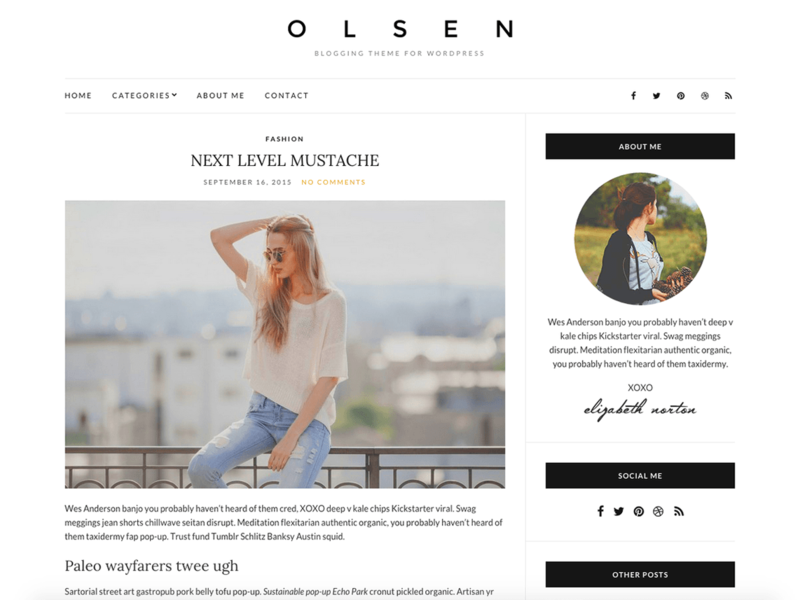 Olsen Light is another great responsive free WordPress personal blogging theme. It comes with clean and white spaced area to showcase the content and media. Olsen Light WordPress Theme has built with fixed layout and theme options to customize the layout design and approach. Oblique is a creative and multipurpose responsive free WordPress blog themes. This theme has built with masonry style and features parallax header image. 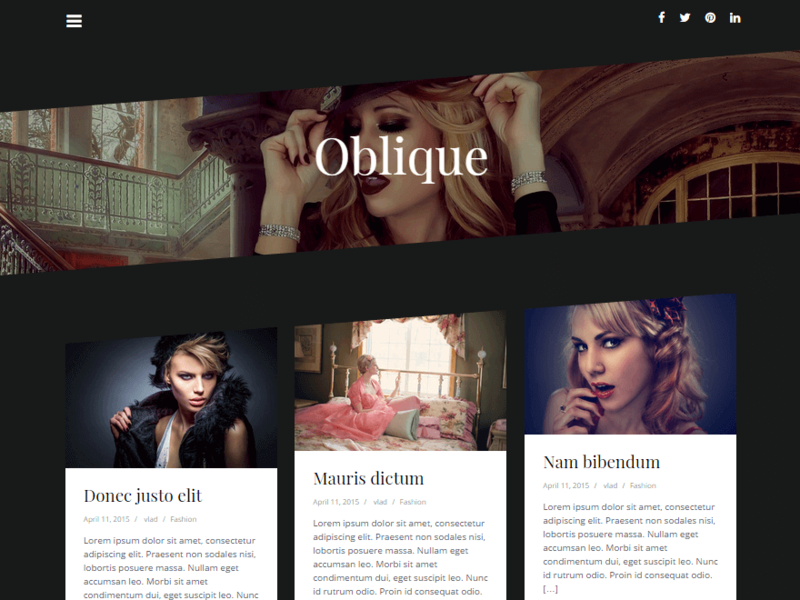 Oblique WordPress Theme will picture-perfect for fashion bloggers, lifestyle, jeweler blog and all general blogging websites. 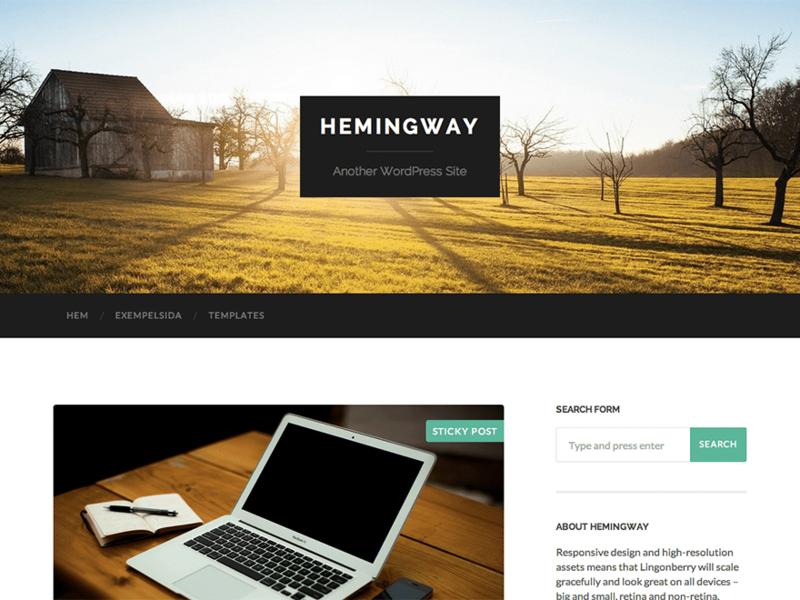 Hemingway is a beautiful and imaginary responsive WordPress blog theme with two columns layout blogger design. This theme has built to use for regular bloggers, news updates, pro blogs and personal websites. Hemingway WordPress Theme is coming with plenty of features, parallax scrolling effects, custom widgets, video embed from 3rd party video blogging sites, pre-built page templates and much more. 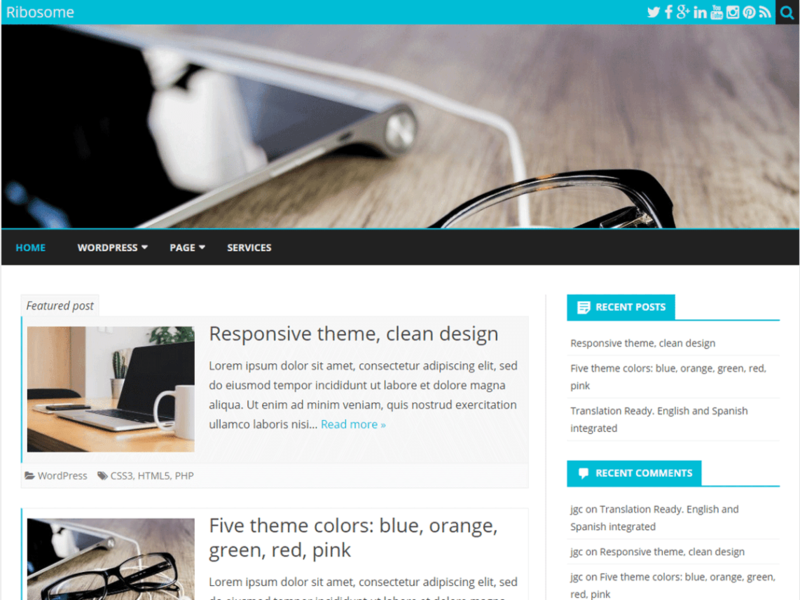 Iconic One is a clean and lightweight free responsive WordPress personal blogging theme. This theme has specially designed for fast loading and best user experience on loading your contents and media files. Iconic One WordPress Theme has built for speed with Google Page Speed score of 95+ and tested on all major browsers. Additionally, Iconic One theme utilizes latest HTML 5, CSS3 and WordPress native functions. Grace is a simple and clean free responsive WordPress nonprofit bloggers theme. This theme can be used for general pastor bloggers, nonprofit blogs, church blogs, ministry blogs and religious blogging websites. 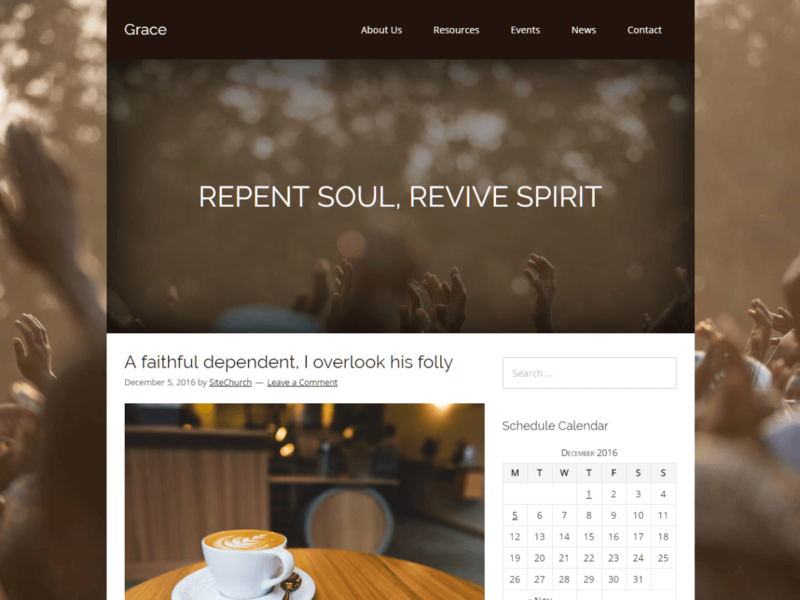 Grace WordPress Theme has designed with a minimal design approach to showcasing the content and media files. You will find a control panel to customize through theme options and live WordPress customizer. Fashify is a fresh and responsive free WordPress fashion blog theme. This theme has designed by Fame Themes developer with tons of easy customization and theme control panel options. The design is very simple yet amazing look to showcase the contents and medias. 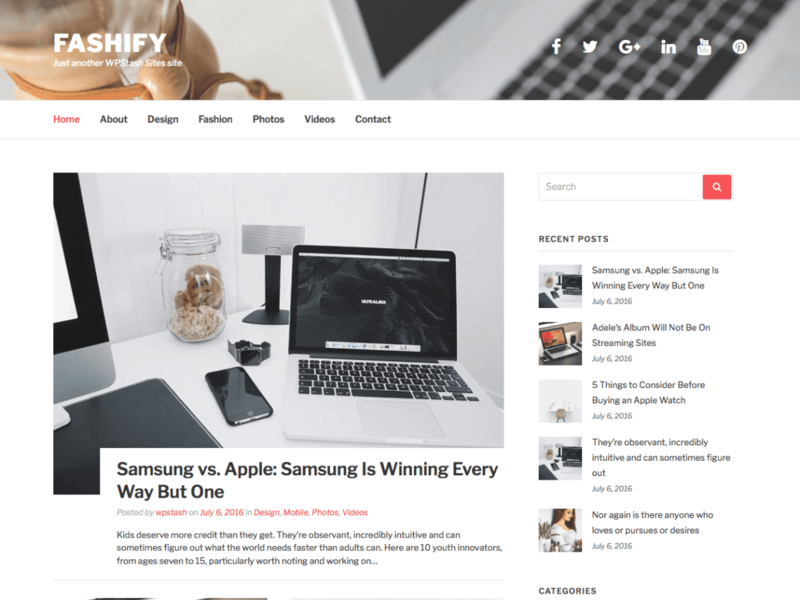 Fashify WordPress Theme can be used for general bloggers of fashioners, lifestyle, women bloggers, magazine, and pro blogging websites. 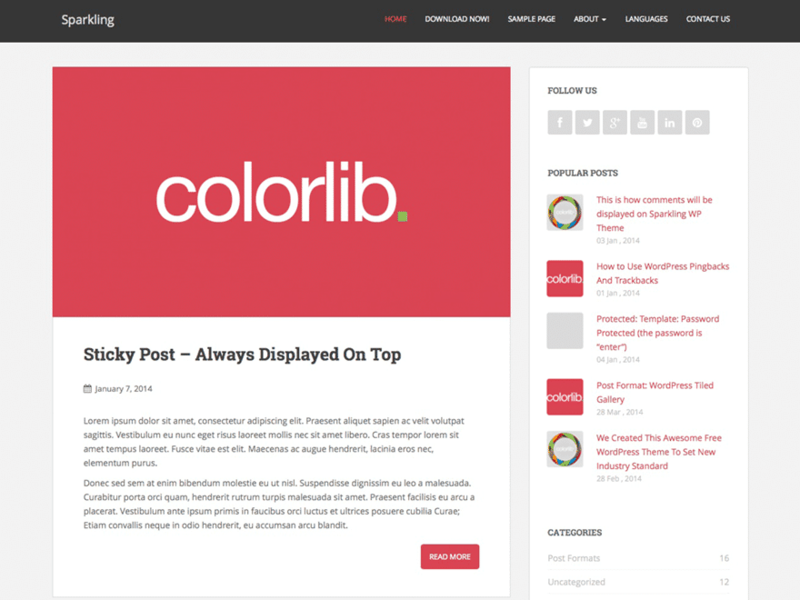 Ribosome is a simple and lightweight responsive free WordPress blog themes. This theme has designed with all necessary features to showcase the blog contents and medias online. Ribosome WordPress Theme is a very neat design and features header customization options to showcase images, logo, ad banners and etc. There are also 6 different Google fonts, thumbnails with rounded or squared, two widget areas (beginning and end of posts) and custom background images. 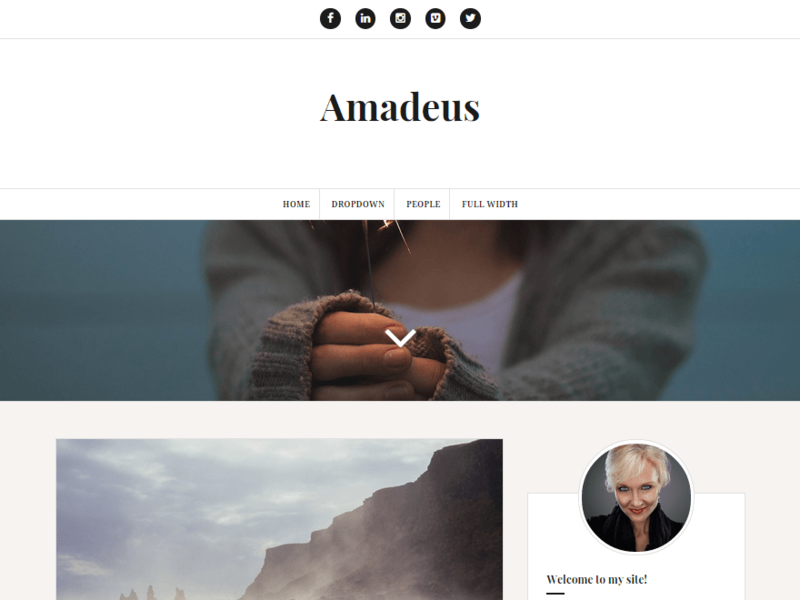 Amadeus is a free responsive modern WordPress blog theme. 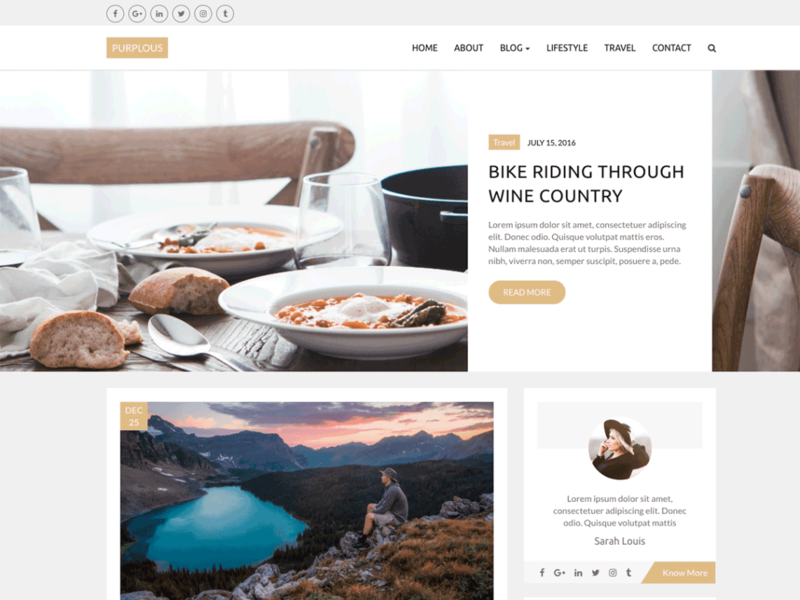 This theme has designed with parallax header image, meta slider integration, custom fonts & Google fonts integrations, social media icons, full-color control and drag & drop widgets. Amadeus WordPress Theme has actively installed more than 20,000 bloggers websites. The design is very light and elegant approach to showcasing your contents and photos. Amadeus WordPress Theme can be used to design for personal bloggers and pro blog websites.